Don’t worry, I did not turn to a life of drugs and crime like on the AMC television show with the same name. 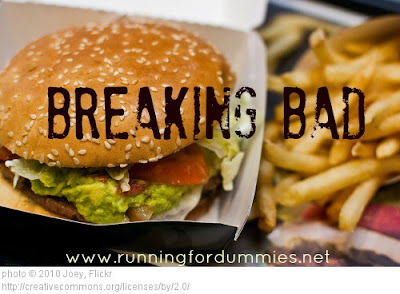 This is my own version of breaking bad. I broke bad in regards to my diet. If you follow my blog you probably know that I am a big fan of the indulgence meal. I strongly believe that the one of the success factors of maintaining a healthy weight and lifestyle is allowing yourself indulgences a couple times a week. I never completely deprive myself of anything. I eat pizza, cheeseburgers, French fries, ice cream, chocolate and tacos, but not all in the same meal! I drink beer and wine in moderation. I enjoy every moment of it. Then I immediately go back to healthy choices for the very next meal. These indulgences have never had an impact on the scale or my goals. The key to my success is that they only occur once, or maybe twice, a week. They are planned and controlled. And then these past 10 days, I broke bad. Last week was a hectic week. I was off work for a couple of days while helping my husband close on a loan for a new work vehicle for his business. We had plans to hit the road to Houston to pick up the vehicle, but due to a mass amount of headaches and things-gone-wrong, we ended up spending most of those two days at the house waiting and frustrated. My usual schedule was flipped on its head for two days. While I will often tell anyone who will listen that I would like to live a life financially independent from my corporate job, I realize now, more than ever, that I need the structure of a nine to five. Every day I pack my meals for the day. Everything that I will consume between 8 and 5 is neatly planned and packed away. The moment I get home from work, I do my Insanity workouts, drink a protein shake, then eat a healthy dinner. After dinner every day we run or walk at least a mile, then I do my dailyplank. This is my routine. Structure keeps me on track. Last week was very unstructured and for the first time this year, I made some unplanned, spur-of-the-moment, emotionally driven, bad food choices during the week days. I went back to work on Wednesday and normally would have been able to jump right back on track, but Hubby wanted to go out to dinner after work that night. It is rare that we go out to dinner, so I jumped at the chance to try a new restaurant. On Thursday we had a friend visiting from out of town for the long week-end. It is certainly not our friends fault that I made poor choices, but it is hard to entertain out of town guests at salad bars while drinking protein shakes. We took him to all our favorite local restaurants. Normally I am big believer in making the healthiest choices possible, doing the best with what you have in front of you. I didn’t do that. I ate whatever I wanted, over and over again. I enjoyed it. Then it was the Labor Day holiday and I had another day off from work. All of this led to more unstructured eating. The thing about bad choices is that the more you make bad choices, the easier they become. I knew I couldn’t let a few bad days turn into new bad habits. I knew I had to turn it around. I was probably the only person in America who was grateful to go back to work after the three day Labor Day week-end. I needed to get back on track, and I know that packing my lunch, structure, and routine was the fastest way for me to get there. I stepped on the scale Tuesday morning because I know that being slapped in the face with the reality of the situation would help me mentally move on back to my regular healthy lifestyle. What did the scale say? Nine pounds up from 10 days ago. Did I actually gain nine pounds of fat in 10 days? Of course not. Was it mostly temporary water weight and bloat, probably due to increase sodium intake? Yes. Would most or all of it go away in a few days? Most likely. One important thing that I need to tell you is that I still did my Insanity workouts everyday during this whole indulgence week. This is further proof that you can’t out exercise a bad diet, even with a hard-core exercise program like Insanity. Repeat. 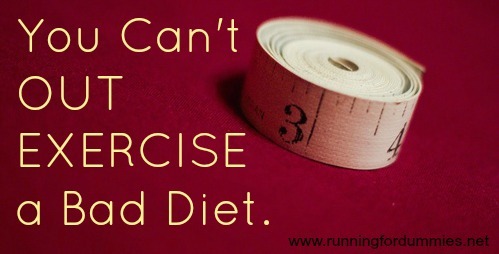 You can’t out exercise a bad diet. The next day I stepped on the scale after only one full day of clean eating and the scale already dropped three pounds. Did I lose three pounds of fat in one day? No. Just like I didn’t gain nine pounds of fat in one week. Then the next day, down another two pounds. Although I am (sort of) paying the price for my poor choices now, I know for a fact that in a week or so my weight will stabilize back to my pre-indulgence week weight. Why am I sharing this with you? It can be embarrassing to admit the scale climbed nine pounds, and if I didn't tell you, you would never know. I doubt anyone looked at me and noticed any difference. I am sharing because this is real life. These are the ups an downs of everyone's fitness journey. We all slip up. It can be too easy to get off track. As long as we pick up and move forward, refocus on our goals, no real harm can be had. As long as we don’t let a bad meal, or a bad day, or even a bad week turn into a lifetime of poor choices, then we are still moving forward in the right direction. One week is such a small part of my life that in a couple of weeks all of this will be completely insignificant. I am not beating myself up about this at all. I actually enjoyed my week It allowed me to temporarily break bad and enjoy some foods I normally would not eat, while providing me with a gentle reminder how much better I feel, physically and emotionally, when I stick to a clean healthy diet. good for you, lea! we all deserve to treat ourselves and break bad here and there! you know how to get back on and keep striving forward and thats all that matters! spa love to ya!!! Oh my yes. Hey, I know how this is, I do it regularly, lol! Last weekend, to be sure. I think you have the healthiest approach, Lea, you don't dwell too much on it. Forgive, move on. thanks for sharing. it's so true - we all have ups and downs on this journey and that's why its not a race. As soon as my schedule changes in the slightest progress is at risk for derailment. I too thrive on routine and I like to have everything planned from meals to exercise! Good for you for sharing with everyone and getting back to business! I was on vacation last week so I indulged A. Lot. And I'm cool with that because sometimes that's just what a body needs. Now, I'm just getting back on track! I definitely have "breaking bad" moments. I get over them by recognizing that I am overindulging and steer myself back into my normal healthy direction. 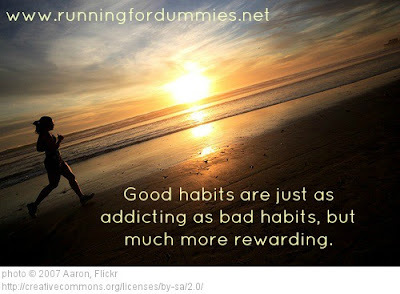 I also have weekly indulgences and those are never planned. Everything in moderation is my way of thinking! Wish you all the lucks! :) Glad to hear your story. I can relate to this, my ozeri scale also awaken me to have a healthy lifestyle. And I'm very thankful for bathroom scale. The Scale: Friend or Frienemy? Year End Resolutions: Do You Know What Today Is? Virtual Scavenger Hunt & 5K - Winners Announced!